Like some of the tough guys on its hockey teams, the NHL doesn't seem to mind throwing its weight around. 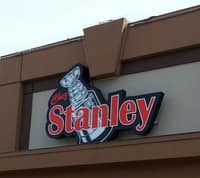 It's sent a legal warning lawyer to Bar Chez Stanley in Quebec City, telling the owner of the neighbourhood sports bar to get rid of its logo. Glenn Wanamaker stopped by the bar to meet with owner Pierre Cuerrier.